Vose Galleries - How Do We Hang a Painting? How Do We Hang a Painting? 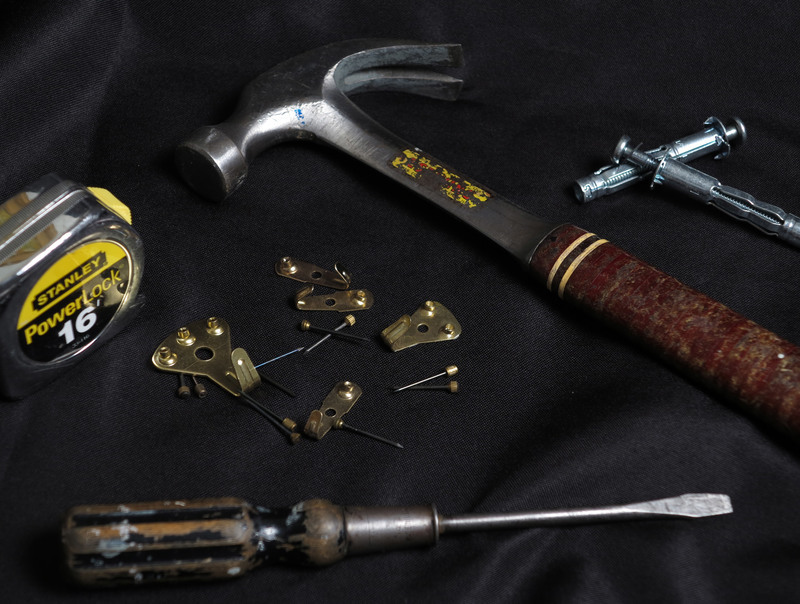 Hanging Hardware Metal loops attached to plates are preferred for heavy works while screw eyes may be used for hanging small works or for frames not large enough to support plates. Hanging hooks should be placed 1/3 of the way down from the top of the frame. Picture wire, preferably of copper for heavy works or twisted wire of appropriate strength, should be stretched between the two loops allowing for a little give. The ends of the wires should extend several inches beyond the hooks to allow for height adjustment. Knot and twist the wire around itself for better security. Bumpers, made from cork or rubber should be glued to the back corners of the frame to allow for air circulation and to protect your walls. Be sure that your walls are sturdy enough to support the weight of the painting. Otherwise, special hooks must be used. How High? Henry Heydenryk, Jr., author of The Right Frame, advises, “a good picture should be hung low, except in the most unusual circumstances.” The viewer, therefore, should be looking slightly down at a work of art, resulting in the middle of the work hanging from sixty to sixty-five inches from the floor in a room in which most people are standing. In a dining room, however, works should be hung even lower to accommodate seated viewers. 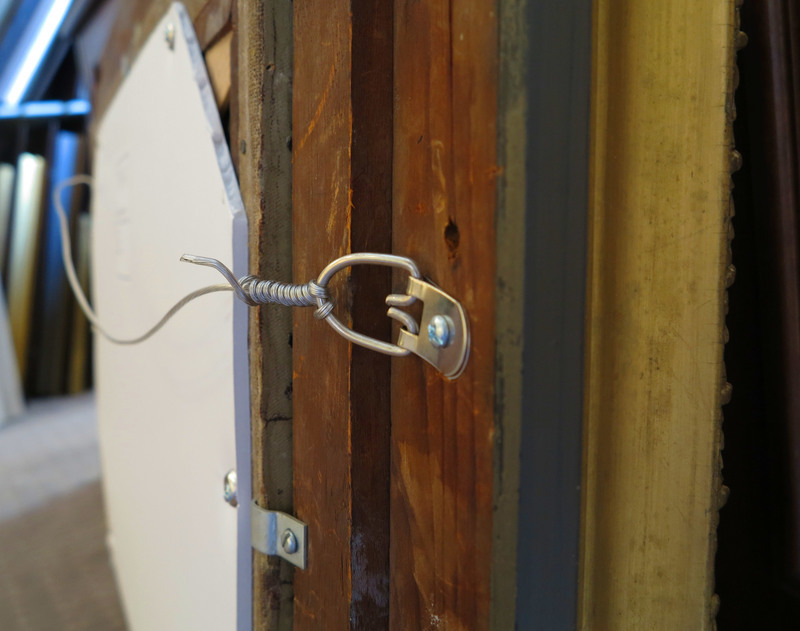 Method We recommend hanging with two hooks to eliminate shifting and to insure the safety of the work. Hooks should be spaced at spots equal to ½ the width of the art work. As an example, let’s assume that we are hanging a painting measuring 24 inches high and 36 inches wide, including the frame. Wall hooks would be located 18 inches apart. Hanging hooks would be located 8 inches from the top of the frame, 1/3 of the vertical measure. 1. Hold the painting in the desired spot. Using a pencil, mark the wall faintly at the middle of the top of the frame. Measure the distance from the mark to the ceiling or ceiling moulding which we will call measurement A. Assuming the height of the wall is 94 inches and our mark is at 74 inches, measurement A in our example would be 20 inches. ​2. To figure where the wall hangers should be placed, use a tape rule and your index fingers to flex the wire on the back of the painting at two points which measure 1/2 of the width of the painting. In our example, your fingers would be 18 inches apart (1/2 of 36 inches, the width of the painting and frame). 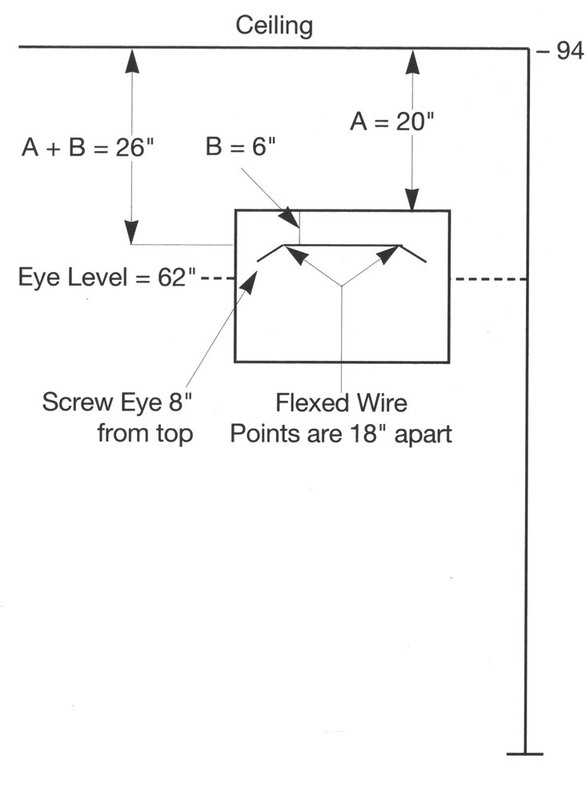 Measure the approximate distance of the wire in this position to the top of the frame. In our example we will assume this measurement to be six inches which we will call measurement B. 3. Now we make a mark six inches (measurement B) below measurement A, or 26 inches from the ceiling. From this point, make a mark 9 inches to the left and 9 inches to the right. These measurements will be the spot at which to hang your hooks. Be sure they also measure 26 inches from the ceiling. Voila! Now you are ready to hang your painting. Not happy with the results? You can adjust the picture wire to give some leeway in height.